Draw a wealth of visitors to your bird garden with the Heartwood Smoke Grey Gatehouse Bird House. The architectural details, bold finish, and functional design combine on this home for a remarkable addition to your bird garden. The traditional, rectangular silhouette creates a fantastic avian shelter, and its beaded edge drop siding evokes an actual home. A hipped roof tops this soft grey frame, its aged red color enhancing both the home and your backyard. The copper cap on the roof gleams in sunlight, and extra copper trim along the roof edges lends an elegant hint to the item. A 1.375" diameter entry hole rests on the front panel, for birds to access the interior with ease, and the roof overhangs this entry for rain protection. Drainage on the base helps the nest remain dry, and ventilation slots beneath the roof ensure fledglings do not overheat. A copper panel on the back of the home may be removed for seasonal cleaning, and the rot-resistant, cypress construction offers durability. Add a mounting plate (not included) to the base of this home for displaying it on a pole, or rest it on a level surface for a different showcase. 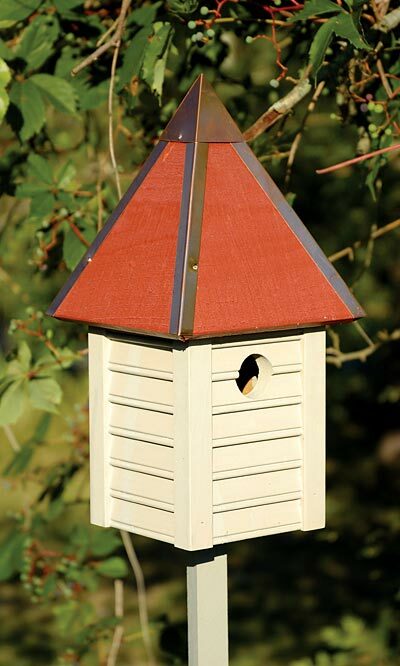 Offer birds their own stately shelter with this Smoke Grey Gatehouse Bird House. Made in the USA.